If you like music, any style, the New Orleans Jazz Fest is the place you need to be during the weekends of April 28-May 8, 2017 at the New Orleans Fairgrounds. The New Orleans Fairgrounds is transformed into a wonderland of music stages, food stations, and crafts marketplaces. Starting Friday, April 28, 2017, there will be talented musicians from all genres hitting the music stages. You can go from Darius Rucker and Pitbull to Big Freedia and Patti Labelle. There is no limit to the type and amount of music you can experience during the New Orleans Jazz Fest. Check out the music schedules for each day and plan your day’s musical entertainment. Don’t worry, there is a lot of food to keep you going until the end of the festival day. 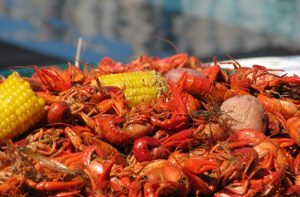 If you want Boiled Crawfish, Red Beans & Rice, and a sno-ball, you will find it and more at the food stations spread throughout the fairgrounds. The only problem you may run into is choosing. With so many wonderful choices, you may have to schedule what food you want between your music schedule. New Orleans is famous for its musicians, but also for its artists. The New Orleans Jazz Fest has three different markets: Congo Square African Marketplace, Contemporary Crafts, and Louisiana Marketplace. You can choose between African Drum Carvings, Jewelry, sculptures, paintings, and so much more. The different markets can offer a wonderful opportunity to pick up gifts for yourself, family and friends. Do you like Cajun Food and Music? When the festival closes its gates at 6pm each day, this does not mean that you cannot experience more music and New Orleans culture. Stop by Mulates The Original Cajun Restaurant for some great Cajun Food and Cajun Entertainment. We are located at 201 Julia Street across from the Morial Convention Center and the New Orleans Riverwalk in the CBD/Warehouse District.